The Travelin' Lundburys: SUN! WE HAD SUN TODAY! The Lund's were up early again this morning, thanks to our local LOUD alarm clock-morning call to prayer! This morning it was at 5:36, at least 2 hours too early for me! The sun came out today--what a wonderful sight that was! After breakfast at our apartment, we needed to find an ATM/Bank to get some Turkish Lira, and also get our Metro/Tram passes loaded. We found the ATM easily, loaded our Metro pass and were ready to explore! Our plan for the day was to go to the Spice Bazaar! We walked in the direction of the tram stop, and saw this small Mosque like building. 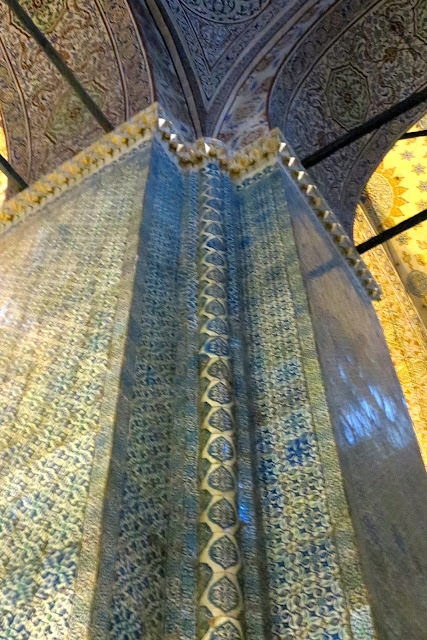 The sign said it was the tomb of Sultan Ahmed I, so we went in to take a look. The inside was very interesting, with displays of the Sultans belongings that were in his original tomb. 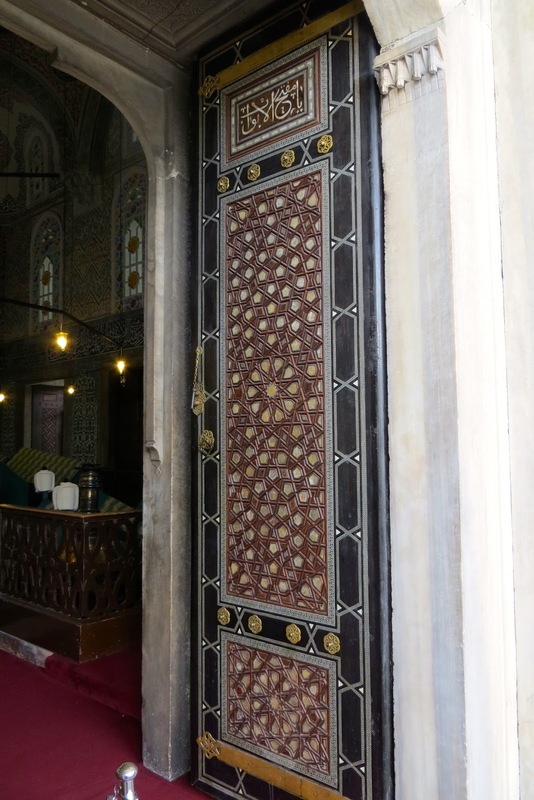 There were Korans, beautifully decorated Koran stands, even fancy inlaid boxes with cuttings from the beard of the Sultan! 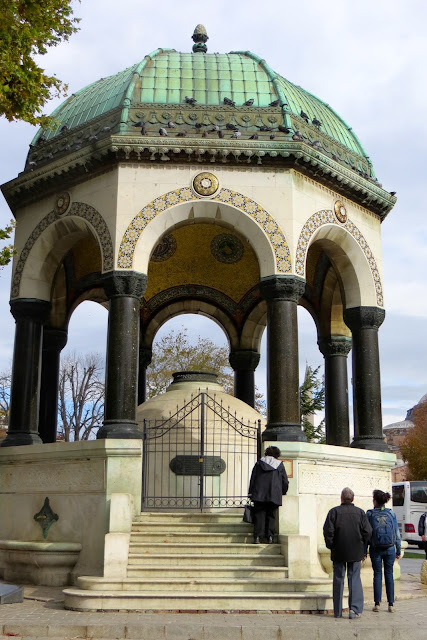 Further along in the square is this pretty fountain, which was a gift from German Emperor Wilhelm II to Istanbul in 1898. We found our Tram stop, and hopped on, it's easier than the Metro--no stairs! 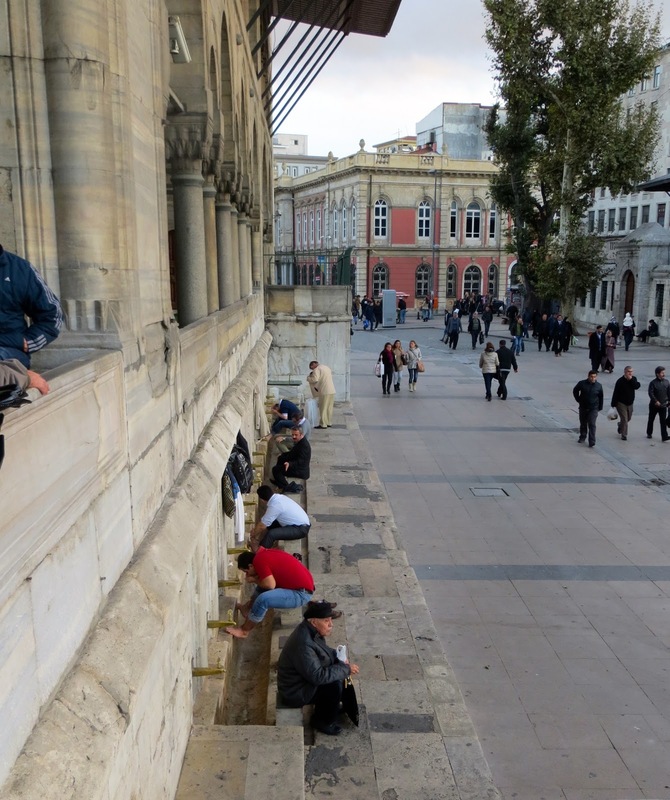 We were right at the Galata Bridge, which is both a pedestrian and traffic bridge across the strait. The lower pedestrian level is lined with restaurants. You can see fisherman on the upper traffic level--they just lower their lines into the water, we didn't see any fish caught. We each ordered a fish sandwich and a beer. Unfortunately, the view was much better than the sandwich The fish was NOT good, and it was full of bones! We ate a few bites and left the rest--the beer was good, though! After that not so yummy lunch, we walked around the square next to the bridge--it was really bustling. Here's a vendor selling roasted corn on the cob, we should have had corn for lunch! 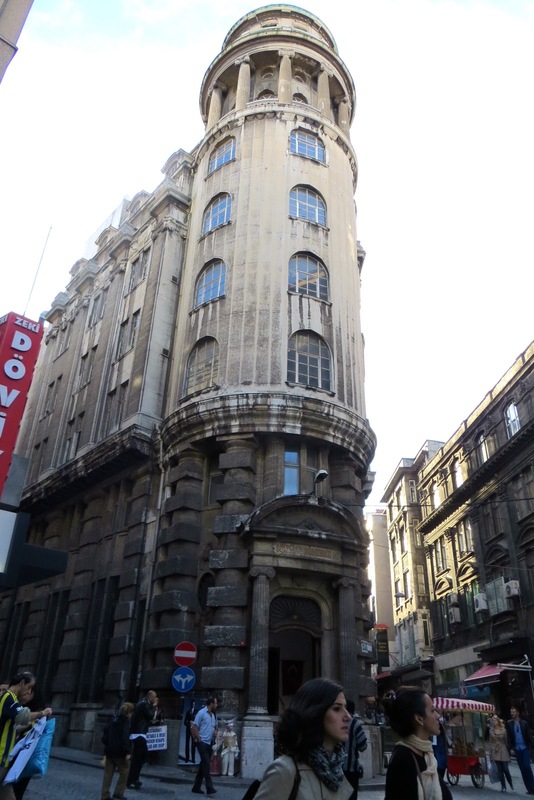 We headed in the general direction of the Spice Market, exploring the narrow streets along the way. Notice the beautiful BLUE sky! Big mounds of Turkish Delight candy--I wanted to try every flavor! 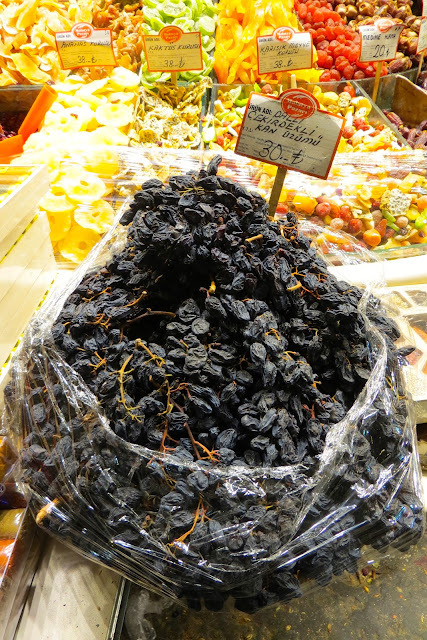 We wandered around the bazaar for a couple of hours, picking out a few souvenirs to bring home. We both enjoyed the fun, hectic atmosphere of the Spice Bazaar. I've read that the Grand Bazaar here in Istanbul is much, much bigger--a maze of hundreds and hundreds of stalls. I guess today was just a training run for us! After we left the bazaar, we decided to explore this big mosque, which was just behind the bazaar. It is the Yeni Cami, but commonly called "New Mosque" It dates to the mid 1600's, and has 66 domes! 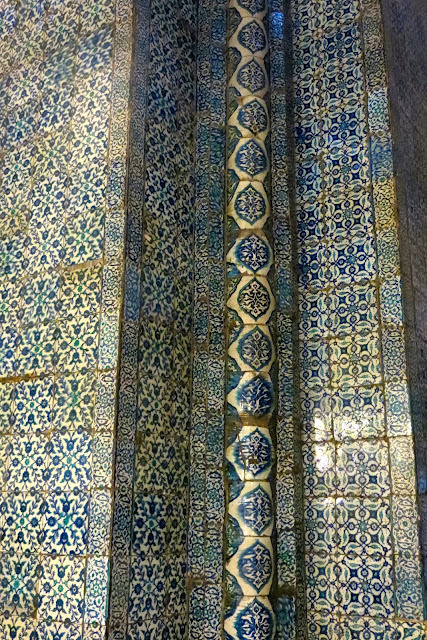 Along one side of the Mosque, there are individual stations for the men to wash their feet. It is a Muslim custom to wash their feet prior to entering the Mosque, signifying spiritual cleansing. So far I've only seen men performing this ritual washing. 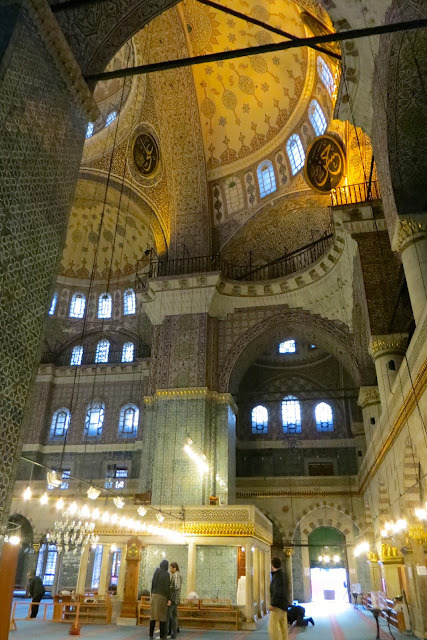 We were so glad that we decided to go inside, we both thought this Mosque was much prettier than the Blue Mosque. The rug with a pretty medallion in the men's prayer area, no women allowed! 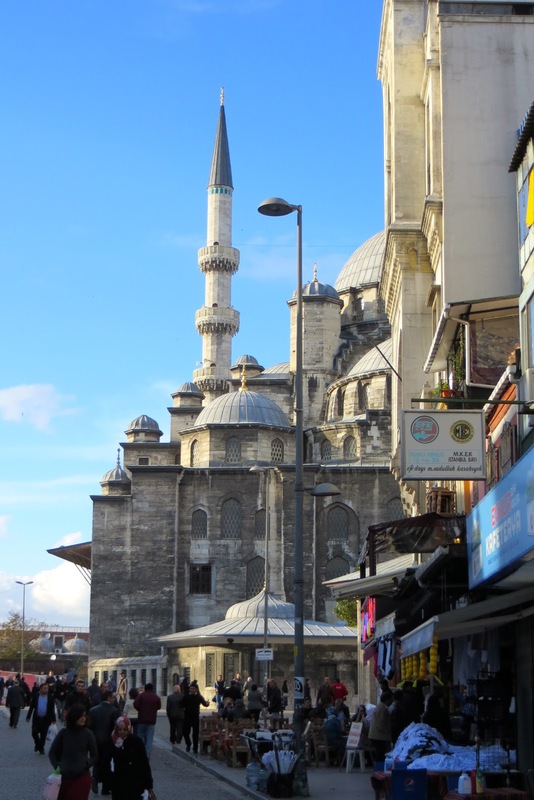 We left the Mosque and walked back to the tram stop, hopped on and rode back to our area-Sultanahmet. It's nice that our apartment is just a short 3 block walk or so from the tram stop. Back at our apartment, we did a load of laundry--this apartment has a washer AND a dryer, which is a real luxury in Europe! We relaxed for a couple of hours, then walked around our neighborhood to choose a restaurant for dinner. We settled on one with lovely outdoor setting, it even had heaters and pretty blankets for the ladies to use if needed! Our waiter, Hassan, was friendly and very talkative. We had a nice, relaxing dinner--talking about our day, visiting with Hassan and enjoying the hustle bustle of the street. We started with a mezes plate, everything was very good; we really enjoy the variety of these plates. As usual, we were served a big lavash--this one had deflated! It was softer than others we'd had, and we liked that better. We chose this restaurant because we thought they had wood fired pizza--WRONG! This pizza was about a "4" on a scale of 1-10--I think they used bisquick for the crust! Oh well, that's what we get for ordering pizza in Turkey! Hassan brought us complimentary Turkish tea after our meal, it's traditionally served in small glasses. All over the city we've seen men in shops, bazaars and restaurants drinking this tea. For some odd reason, I've not seen women drinking it! 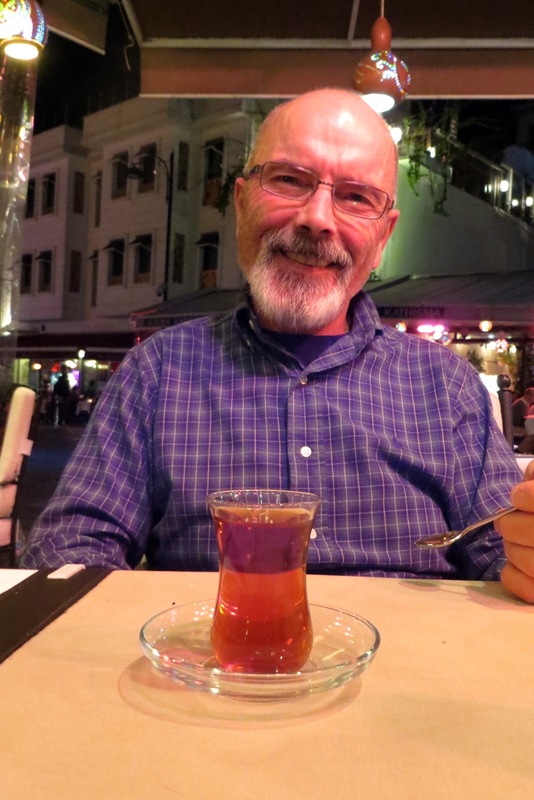 Here's MY man with his Turkish tea! Just like last nights dinner, the food wasn't extraordinary, but the experience was wonderful. We have been so impressed by the Turkish people, and are really enjoying our interactions with them all--from the shopkeepers to the Tram attendants, they are unfailingly kind and helpful. An interesting note: We have been asked COUNTLESS times about our recent U.S. election! My first time was at the airport Tuesday evening-at passport control. I handed the gentleman my passport, and he smiled and said "Romney or Obama"? I was so surprised, I just laughed and declined to answer--what if I gave the wrong answer--would he not let me in? It was all in good fun, and I enjoyed the banter back and forth. We have been asked so many times we've lost count, and have had some very interesting conversations! Unanimously, the Turkish people who have asked have been for Obama, and are very happy that he has been re-elected. Another note: We have had so many wonderful conversations with shopkeepers, Tram attendants and waiters, etc. We have talked to dozens of them--but not one single woman! Literally-not one conversation with a woman. In one shop I went into, there was a husband and wife who were obviously the owners. The woman was behind the counter, and her husband was seated on a small stool a few feet away. I showed the woman what I wanted, and her husband gave her directions. Of course, some of this may have been the language barrier, but it was very clear that he was in charge! Certainly very different from our culture, and that's why we love to travel! 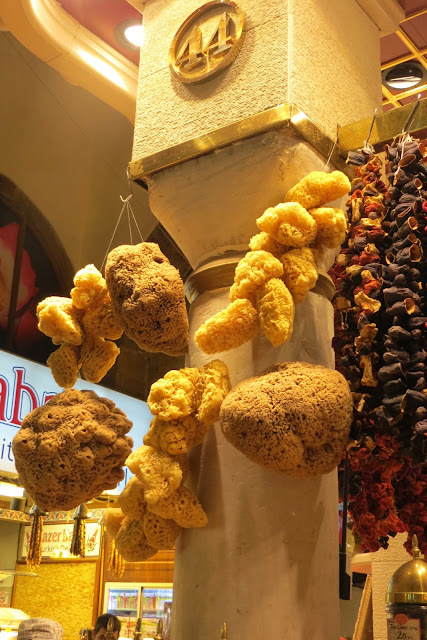 Tomorrow (Friday) in Istanbul: Our plan is to spend the day at the Grand Bazaar! Hello Ms. Di and Daavid. What beautiful patterns and colors and artwork. Every place that you visit is more intriguing and awesome than where you visited before. And it sounds like the people there are also beautiful and inviting - of course knowing you and Dave you would probably meet nice people where ever you go. You both were in my thoughts today - I am making home-made chicken noodle soup and wish I could share it with you. All those spices there look so inviting -- I bet you will be bring some home. We had a small amt. of snow early this morning; but, by noon it was all gone and the sun was shining. Glad to hear that you had a sunny day for a change. I know you will have fun at the Grand Bizarre. Enjoy, enjoy! So Turkey is glad we elected Obama...I'm glad someone is!